When Painkiller arrived on the scene in the early 1990s with their debut “Guts of a Virgin”, their aesthetics and their line-up seemed to be a calculated provocation for jazz purists bringing together New York’s downtown scene icon John Zorn with jack-of-all-trades bass player and producer Bill Laswell and Napalm Death drummer Mick Harris. How could this work? Free jazz goes dub reggae goes grindcore metal? We all know it did. The Prophecy (Live in Europe) is their first regular album in years compiled from live performances recorded on a Europe tour between 2004 and 2005 where Zorn and Laswell were joined by Tatsuya Yoshida (of The Ruins and Korekyojin fame) on drums. Bookended by two very short pieces called „Prelude“ and „Postlude“ the central composition is the 65-minute title track, an acoustic sculpture displaying Painkiller’s musical philosophy in a compact form. As usual there is John Zorn’s nervous, hyperventilating, shrieking alto saxophone and Bill Laswell’s bubbling electric bass, deeply rooted in dub reggae and rock. It has always been his appearance that has made Painkiller so special, his bass is much more a second solo instrument than a simple provider of pulse. The interplay between the two alpha dogs Zorn and Laswell is the thing that keeps the listeners focused for more than an hour. Yoshida’s approach isn't as brutal as Harris’s, but very physical, though, displaying the necessary rhythmic barrage for his bandmates with absolute tightness. 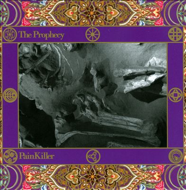 “The Prophecy” is only one track but it is actually a postmodern medley of hardbop lines, a rolling e-bass, whirlwind noise, a “A Love Supreme” quotation on bass in between fuzzbox and wah-wah madness, Black Sabbath hints, sax staccato chopping, hectic circular breathing, bumpy avant-garde funk, speed metal, and high intensity machine gun drums. John Zorn is known for the fact that he includes all kinds of philosophies in his music. Painkiller, however, is “just” a soundtrack for the life in a megacity with all its facets – breathlessness and rest, alienation, multiculturalism, monotony, glamor, isolation, beauty and desperation. It is a conglomeration what life (and music) has to offer – it is a fascinating tour de force.